Done Never Is - Eric D. Brown, D.Sc. Last week, David Aponovich from ISITE Design wrote a nice piece titled Avoiding the CMS Death Spiral on ISITE’s CMS Myth blog. If you don’t know who ISITE Design is, you should…especially if you are in the digital marketing space. Those guys are top notch. I tried to hire them many times when I was working at the Boy Scouts but could never get the projects funded (might just be why I’m not there anymore). Note: I tend to use “CMS” to mean “Web CMS” or “WCMS” – in this article these terms/acronyms are interchangeable to match what David originally used it in his post. A CMS project takes on a life of its own, much like any other software project. That said, most organizations undertaking a Content Management System project fail to understand that real underlying issues that they will face during and after the project. Most people think a CMS project is as simple as selecting, paying for and implementing a CMS….but it isn’t. A CMS project is everlasting. There will always be ‘something else’ to do. There will always be a new feature or some functionality that will be needed for some new web feature or function. Done never shows up on a CMS project. Done never is. Of course…there are times of ‘done’ according to a project plan. The goal of a project can be reached. There is a point when a CMS is ‘implemented’. But…there will always be changes and there will always be new items to add. That’s what organizations need to understand. Many think a Content Management System is something you buy and install and use. But, I’ve never found that to be the case. There’s always something more to be done. So…if you are currently looking at implementing a Web Content Management System, think long and hard about how you are staffed today and how you will be staffed in the future. Don’t make the mistake a former client made in thinking that after the purchase and implementation of a CMS, he could reduce headcount. In fact – he needed to increase headcount or at least move headcount around to ensure proper staffing. That particular project was never staffed properly for the long term from the IT group’s side. One of the biggest mistakes I’ve seen with CMS projects is the failure to staff. Most clients but [sic] a CMS platform, pay a vendor to implement it and then expect ‘done’ to arrive one day. RT @jeffpcox: Great post! 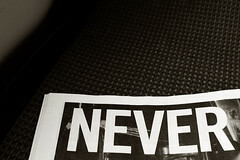 RT @ericdbrown: Published: Done Never Is http://bit.ly/hZ60is <– Thx Jeff! A problem I often see with people’s approach to having a CMS website is that lots of people think that a CMS means not having to pay a developer for any more work, and then end up wasting money by never updating their site, so that a static build and occasional paying someone to make updates would have actually been much cheaper. I’m always bemused when building a CMS, something like 50% of the work is just trying to make it so the client can’t break it! Very true Richard. Thanks for stopping by!